Life in a tea cup? ... or staying WHERE we belong! Have you ever felt out of place? Most of us have at one time or another. There is a good reason for that. The scriptures say in Hebrews 11:13, that all those that died in the faith before us "... confessed that they were strangers and pilgrims on the earth." 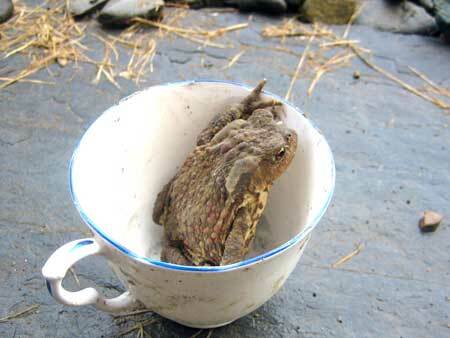 So we shouldn't feel any more "at home" on this earth than this little garden toad does in a teacup! He didn't stay in there very long, and scrambled back out to his natural habitat with soil and plants and bugs. (Umm umm good!) Funny how we do the same thing: so quickly forgetting that we are no longer of this world and gravitating back towards it again. "That his prayer was nothing else but a sense of the presence of GOD, his soul being at that time insensible to everything but Divine love: and that when the appointed times of prayer were past, he found no difference, because he still continued with GOD, praising and blessing Him with all his might, so that he passed his life in continual joy;"
So we just need to remember to stay in the cup - in communion with God! (It is a wonderful little devotional book, and you can read it free online here.) 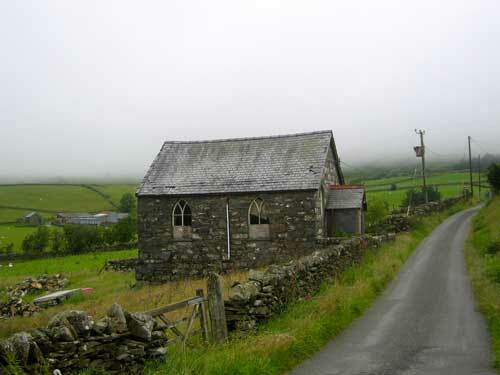 This old abandoned chapel near Blaenau Ffestiniog is sort of a picture of what can eventually happen to us if we don't stay plugged into the vine! We went up north last week for the monthly meeting, and it was nice to see our friends again, as we hadn't been since May. There have been a few new people coming, and so it is good to hear that the group is growing. A special treat last Thursday was to have a short visit with David, the new minister at the Anglican Church. They have been there for three months now, and are glad and excited to be there. And we are so glad that they are there too. It is a wonderful answer to prayer, and so great to hear of their love for the people of the church and the town. Besides attending our monthly meetings, David and Becky have started a small group in their home the other Wednesday evenings of the month. They are slowly engaging with community, have started a food bank, and looking for other ways to serve and love on Blaenau Ffestiniog and the other two neighboring towns. Please remember them and their four children in your prayers. NEWS FLASH: In Haverfordwest about 25 miles south of us in Pembrokeshire, there is a moving among a community of gypsies, or "travelers" as they call them in the U.K. Over thirty have been wonderfully saved and baptised two weeks ago, and there are more to come. Please pray for wisdom for the leaders and that the Lord continue to draw more and more hearts to Himself! A very heartfelt thanks for interest and your prayers! A Collection of Prophetic Words for Wales! words and pictures that have come to my attention over the years. older words as they come to my attention. Here is the link: http://wordsabout.walesawakening.org. us for God's hand to pour out blessing over Wales and the nations of the world. 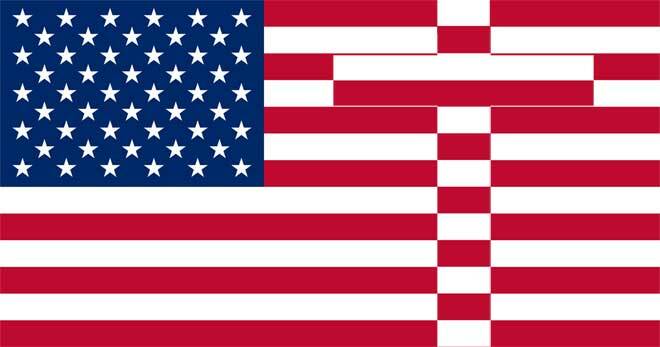 Please pray with us that God bless America, and return us to our first love for Him!